FRANKSTON Council has knocked back a request to pump more money into South East Water’s new headquarters being built besides Kananook Creek. The Times can reveal the water utility company asked council to contribute about $700,000 to help “beautify” a promenade area on the banks of Creek outside South East Water’s new building between Wells and Playne streets. South East Water has leased land around the building site, including the promenade area at the creek’s edge, from council to move heavy machinery in and out of the site while the 38-metre tall building is constructed and must return the area to its original state before building works began as part of its planning permit conditions. The Times understands South East Water wished to “upgrade and beautify” the promenade area to better reflect its new building’s design but council baulked at contributing half towards a project estimated to cost about $1.5 million. The mayor Cr Sandra Mayer attended a “topping out” ceremony with South East Water managing director Kevin Hutchings last Tuesday to mark the main structure’s completion. It was all smiles at the ceremony with the mayor declaring “South East Water’s new precinct next to Kananook Creek Boulevard will bring hundreds of jobs to the area, provide ongoing employment opportunities and inject millions of dollars into the local Frankston economy each year”. 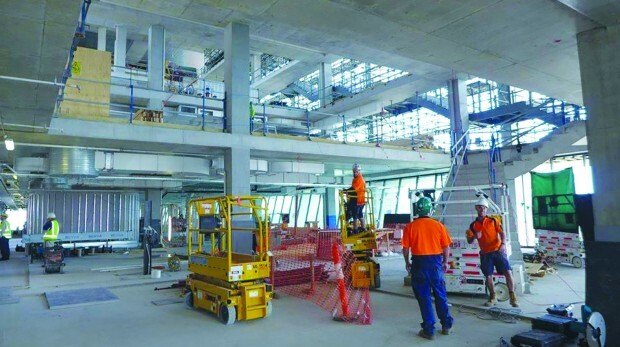 However, behind the scenes there is some unease at council about South East Water asking for more ratepayers’ money to improve the building’s surrounds since council has already made several contentious inducements to bring the company’s headquarters to Frankston amid competition from the Kingston and Dandenong areas in 2011. At the time Mr Hutchings said the move to the new building in Frankston would “save us and our customers at least $20 million over the next 20 years”. South East Water paid council $4 million for the site stretching from Beach St in the north to Playne St.
Council ignored its own building height restrictions and fast-tracked its planning process without architect plans to entice South East Water to Frankston. As a statutory body, South East Water will pay no council rates. When asked about the request from South East Water for more money, Cr Mayer said “council has a strong relationship with South East Water and will regularly meet to discuss a wide variety of matters, in regards to the construction of their new headquarters”. Cr Mayer confirmed “South East Water has requested a contribution from council towards the portion of public realm outside of the area required to be completed”. “While no final costings for the works in this public realm have been determined, council has advised South East Water that they would not be contributing to these works,” she said. The mayor advised “council applied a rental charge on areas of land outside of the site occupied by South East Water with the rental amount levied being $1.34 million”. South East Water spokeswoman Caitlin Rode said the company had made an “approaching move” to Frankston Council about “development of the area’s surrounds”. “South East Water intends to reinstate the boulevard to its original condition, though we welcome opportunities to work collaboratively with council in regards to any further development of the area,” she said. The building is expected to be open for business later this year with or without an upgraded promenade area.